Der Beitrag stellt Untersuchungen von Jugendgruppen in den IDS-Projekten Kommunikation in der Stadt und Deutsch-türkische Sprachvariation in den Kontext der deutschsprachigen und internationalen Jugendsprachenforschung. Arbeiten aus dem erstgenannten Projekt haben zur Etablierung ethnographisch-gesprächsanalytischer Ansätze, solche aus dem zweiten Projekt zur Konstituierung von Mehrsprachigkeit unter Migrantenjugendlichen als Forschungsgegenstand beigetragen. Die Mischsprache der Powergirls weist in ihrer sozialen Funktion und biografischen Verteilung sowie in lexikalisch-phraseologischer und diskurspragmatischer Hinsicht deutliche Parallelen zu monolingualen Sprechstilen Jugendlicher auf. Die analytischen Leitkategorien der Mannheimer Soziostilistik schlagen eine Brücke zwischen verschiedenen Perspektiven auf Jugendsprache und bieten daher einen konzeptionellen Rahmen für künftige soziolinguistische Untersuchungen des Sprachgebrauchs im Jugendalter an. This paper places research on interaction in youth groups carried out in two projects at the Institute for the German Language in Mannheim (IDS) in the context of German and international research on youth language. 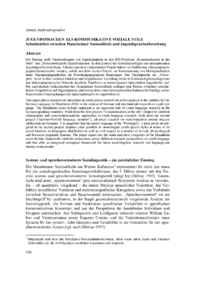 The Mannheim socio-stylistic approach is an important part of youth language research in the German-speaking countries. Work from the first project (Communication in the city) helped to establish ethnographic and conversation-analytic approaches in youth language research; work from the second project (German-Turkish language variation), advanced research on multilingualism among migrant adolescents in Germany. It is suggested that the mixed language of the Powergirls, a peer group investigated in the second project, displays clear parallels to monolingual youth speech styles in terms of its social function, its biographic distribution as well as with respect to a number of lexical, phraseological and discourse-pragmatic features. The paper argues that the main analytical categories of the Mannheim socio-stylistic framework establish connections across different research perspectives on youth language and thus offer an integrated conceptual framework for future sociolinguistic research into language use among young people.